Head south down through the Lentil Curtain, past the solemn camels at Imhoff with their legs folded beneath them, along Misty Cliffs where the turquoise sea is dotted with surfers, on through the fynbos towards Cape Point, and eventually you get to the 250-year old Cape Farmhouse, situated at the foot of Redhill. A small stage in one corner overlooks a vast, shaded veranda with tables scattered about it. Mother Nature has kindly built a sloped grass ‘amphitheatre’ to one side, on which – when we arrived – people had languidly thrown blankets and were relaxing in the dappled shade. On swings under the oak trees little girls in summer dresses overlooked the proceedings. The average crowd at the Cape Farmhouse ranges from babes-in-arms to grandparents, but with a distinct contingent of hipsters and hippies – this is Scarborough after all. There’s a bar, there’s good, tasty food (hot dogs, burgers, pizzas, salads with the most delicious hummus). Basically it’s the perfect late summer Saturday afternoon concert venue. Jack Parow is infamous for his expletive-rich prose and for being proud of his roots on the other side of the Boerewors Belt. The merchandise stand was doing a roaring trade in sales of his iconic long-peaked cap. When Parow appeared on stage there was no fanfare, no fluff, just him. My excitement was not misplaced; the man is a musical genius. His lyrics are clever, thoughtful, and socially and politically charged. He engages with his audience completely, while downing shots of Jägermeister, which he refers to as “tiny glasses of Coke”. 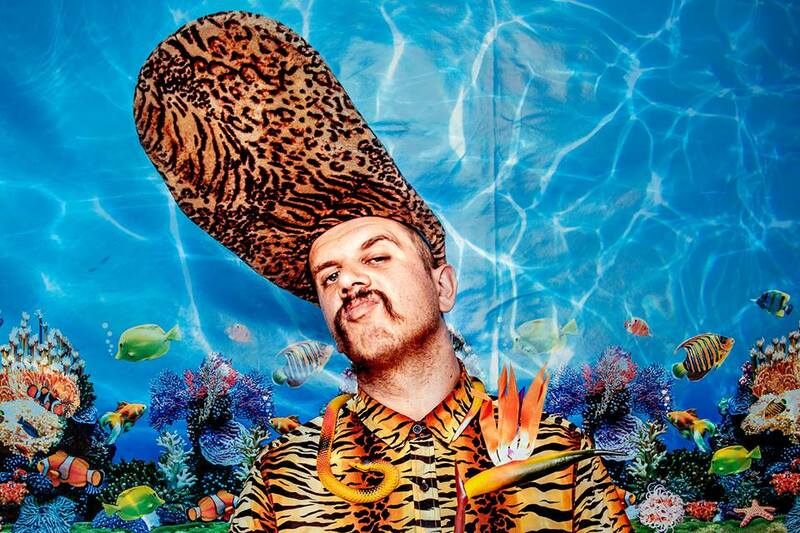 Despite all the wild-living ways we expect of a real rock star, Jack Parow just comes across as a seriously nice guy. The man brings Afrikaans alive, in its most raw, scullery reality. There is an alchemy to the way he breaks down class, social and political constructs in a noisy, energetic flurry of hard-core words and beats. And he and his audience have a ‘fokken’ good ‘hard partyjtie’ while he does it. My three favourite bits: his searingly honest, love-laid-bare song to his daughter, Ruby, called Befok; the energy coursing through the crowd as he played his more hard-core stuff, which had heads bopping, and bodies jumping; and his guitarist, Louwtjie Rothman, another musical genius. You must hear the man play. Swoon. Boerwors Belt meet Lentil Curtain: it seems you’ll get along just fine. Jack Parow performed at the Cape Farmhouse on 11 April 2015 as part of the Cape Farmhouse Summer Concert Series.